Blackjack games are played between the player and the dealer. In all land casinos there are several players at the blackjack table. The game is played with the help of 1-8 decks. Each deck consists of 52 cards and they are dealt by the dealer from a special box that is called a shoe. The main idea of the game is to get 21 points earlier than a dealer but without going bust, which means without exceeding the number of 21. 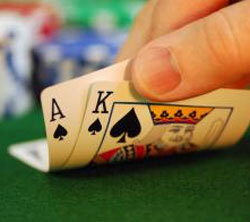 It is very important to learn how to play blackjack before start practicing. So, here are the basic blackjack rules. The players make their bets before the game starts. The dealer deals each player with two cards face up and then deals two cards to himself but only one card is face up as the other is face down. After the cards are dealt the players can decide what to do next: to hit, stand, split or double. When all players stop taking cards, it is the dealer's turn to open his second card and start playing. The rules for the dealers are very strict and differ from those for players. The dealer must stand if he has 17 points or more and should always hit on 16 or less (this game usually varies from casino to casino, and even from table to table). At the time the dealer finally stands, the player's hand is compared to the dealer's hand and the hand of higher value wins. For example, if player has 19 points and dealer has 20 points - the dealer wins. The interesting feature of blackjack is that it is possible to bust, which means to exceed 21 points. This is automatically considered as a loss. If player gets more than 21, he loses his bets even prior to the dealer opening his second card. In case of winning, the player is paid even money. If the dealer wins, the player loses all the bets. One more interesting blackjack feature is that it is possible to get a natural Blackjack. It means that to get 21 points with the first two cards dealt at the beginning of the game. It is paid 3:2. Hit - this option allows players to take one more card. Players can hit as many times as they want until they stand or bust. Stand - if players stand, they take no more cards. Split - if the first two cards that are dealt are a pair of cards of the same value, a player has the right to split them and play with two different hands. There is even the strategy for splitting pairs for players. Double - this option allows players to take one more card and double the initial bet. However, after doubling players stand automatically. Small cards are counted according to their ranks. For example, 5 is counted as 5, 7 is counted as 7 and so on.